The Tesla Roadster that rode SpaceX's Falcon Heavy rocket into space Tuesday afternoon seems poised to overshoot its mark, with company CEO Elon Musk tweeting a diagram showing that the car's current trajectory will take it beyond Mars and into the asteroid belt in its planned orbit around the sun. 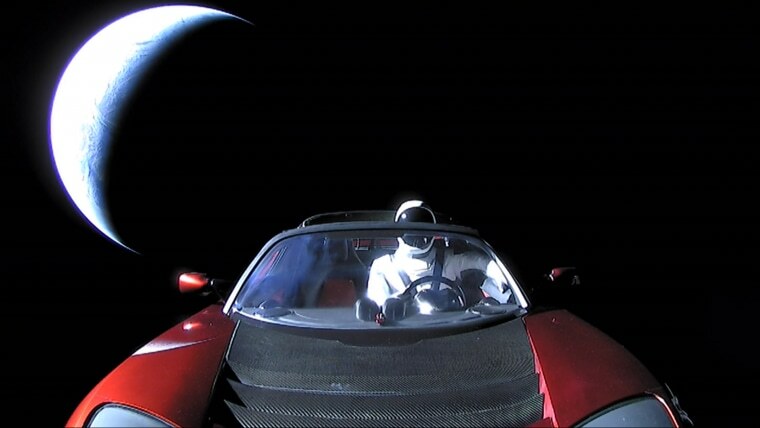 But experts nonetheless predicted smooth sailing for the cherry red convertible and the spacesuit-wearing mannequin, Starman, positioned behind the wheel. Even in the asteroid belt, it seems the car is unlikely to encounter anything beyond ultraviolet radiation, cosmic rays and other highly charged particles, and the occasional micrometeroid. Exposure to all of this "would be unhealthy for humans but will only very slowly degrade the Roadster and its rider," Dr. Seth Shostak, senior astronomer at the SETI Institute in Mountain View, California, told NBC News MACH in an email. "Indeed, this car is surely destined to rack up billions of miles before disaster hits — if it does." Shostak said disaster could come in the form of a collision with Earth or Mars or possibly an asteroid. But he estimated that the spacefaring Roadster "has less chance of a collision each year than all the Roadsters plying the highways of Earth put together." With no oxygen and no water, there's no chance that the Roadster will rust. But given the ongoing exposure to UV light, the car's "paint will start to fade over time just as any car does here in Phoenix in the desert," said Dr. Jim Bell, a planetary scientist at Arizona State University and the president of the Planetary Society. In a press conference held after the launch, Musk said he expected the car to be "out there in space for maybe millions or billions of years." But Bell isn't so sure. He said that at some point — perhaps 50 to 100 years from now — it will be "a juicy target for salvage," and someone will mount a new space mission to recapture the Roadster and bring it back to Earth. "If Elon is still alive," he said, "he might want the car back." Until then, the Roadster has a lot of traveling to do. SpaceX hasn't publicly announced precisely where the Roadster is at this point in what will become a highly elliptical orbit around the sun. But Dr. Nahum Arav, a Virginia Tech physicist who works with NASA, told MACH in an email that his rough calculations show that as of 3:40 p.m. ET today the car had traveled about 450,000 miles from Earth, or roughly twice the distance from Earth to the moon. He said it would take at least six months for the car to cross the orbit of Mars, as shown in the trajectory Musk tweeted.